The living spaceship or "bio-ship" is a space-going vessel composed mostly or in totality of organic or biological materials. 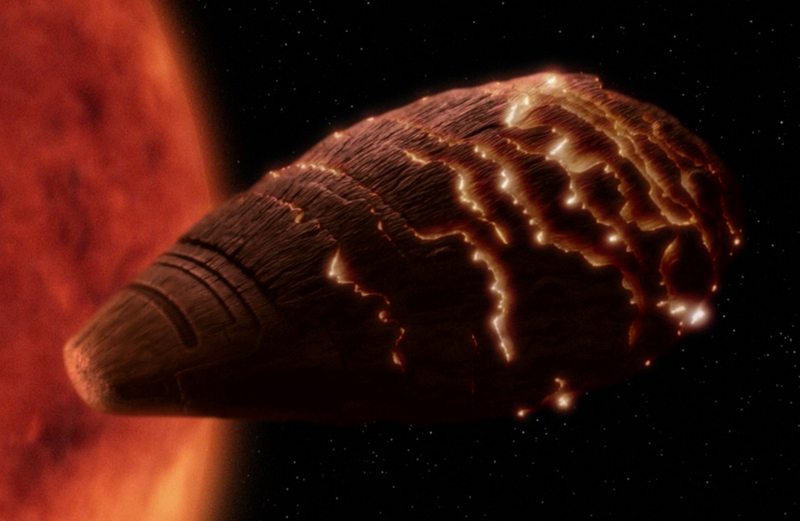 Most bio-ships poses more than a rudimentary intelligence, and are depicted as benevolent and loving beings. Also, there's often some sense of symbiosis or emotional connection between a living ship and its crew or pilot. Over the course of cult-TV history, many bio-ships or living spaceships have appeared. Arguably, the most well-known or famous bio-ship is Moya, loving home to refugees in the Uncharted Territories in Farscape (1999 - 2004). Moya is a gentle space-whale of sorts, one with emotions and high intelligence. She also feels pain when attacked. Moya, like all life-forms, is also able to reproduce. Early in Farscape's run, she produces a child, Talyn, who -- because of genetic meddling -- is a Peacekeeper battleship. Moya also boasts a strong connection to "Pilot," a gentle, turtle-like alien who serves as the bio-ship's link to the humanoid world. Pilot often feels Moya's emotions, and is an advocate for her well-being with the biped crew. One possible predecessor to Moya may be "Gomtuu," of the Star Trek: The Next Generation (1987 - 1994) third season episode, "Tin Man." In this 1990 story, Gomtuu is an acorn, or sea-shell-shaped bio-ship who is able to communicate on an empathic level with Tam Elbrun (Harry Groener), an unstable Betazoid. Gomtuu explains to Elbrun (and subsequently the NCC-1701-D crew...) that the bio-ship feels intense guilt over the accidental death of its humanoid crew. In addition, Gomtuu -- like Tam himself -- is lonely. 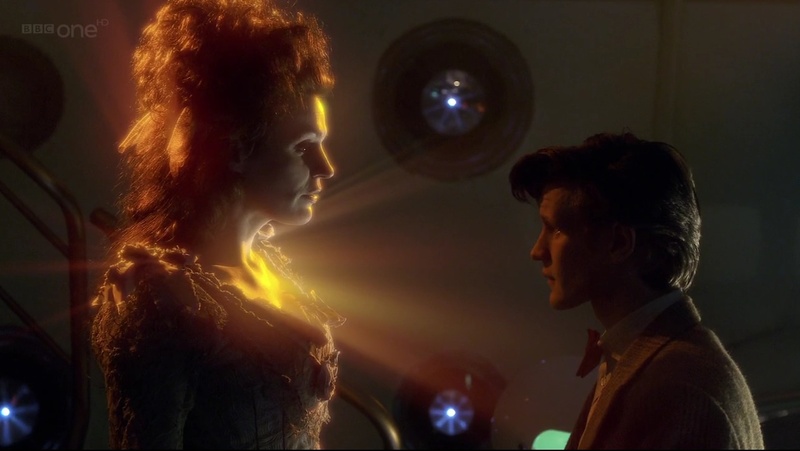 The episode is about two disparate beings finding perfect companionship in one another. In Doctor Who (1963 - 1989; 2005 - ), the Time Lord's famous conveyance, the TARDIS is also often considered a "living being." In recent years, this status as a distinctive and separate life-form (rather than as a machine, for instance) has become more plain, especially in episodes such as "The Doctor's Wife," during the era of the Eleventh Doctor (Matt Smith). In Doctor Who history, bio or organic ships have also appeared during the Jon Pertwee era ("The Claws of Axos"), and the Tom Baker era ("Terror of the Zygons"), as vehicles belonging to invading or dangerous aliens. 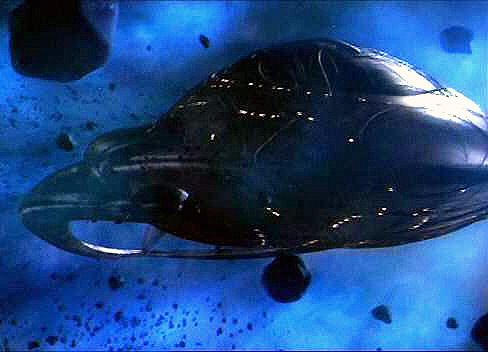 Other biological ships have been seen on Babylon 5 (1994 - 1999) in regards to Vorlon and Shadow Alliance vessels On Star Trek: Voyager (1995 - 2001), the devilish Species 8472 also flew organic space ships through a region of "fluidic" space in the Delta Quadrant. Some series, including Voyager, have also featured spaceships with "biological" circuitry, but which could not be considered alive in any traditional or conventional sense. In the Year One episode of Space:1999, "Gwent" was a living mechanical ship, not organic, but still possessed of life and the (apparently universal...) need for companionship.